As soon as Wayne Konrardy retired five years ago, he turned to his first order of business. Wayne, whose father worked at the Dubuque Packing Company, and his wife, Mary, are loyal Dupaco members. 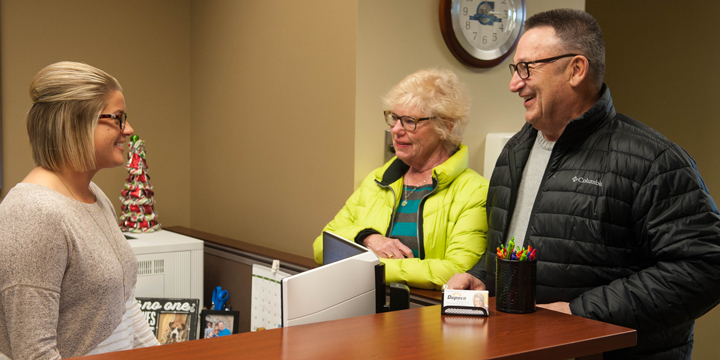 Since the late 1960s, they’ve turned to their credit union for everything from car and home loans to checking and savings accounts. And when Wayne lost faith in the company managing his investments several years ago, he moved those to DFS, too. “I like that they care about me. They listen to what we say, and they give us recommendations and tell us why we should do it,” he said. Wayne and Mary take different approaches to their investments. While Mary is more conservative, Wayne enjoys dabbling in stocks. DFS has structured their investments to reflect their preferences. DFS also has provided guidance to the couple when they purchased a car and had work done on their deck and driveway.